Carl Sovlin became the second 2nd Dan graded by Steven Beresford, his grading was a tough test of all his Karate ability. The test was in 3 parts, Kata and Kihon, Teaching and Kumite and Application of Kata. Carl showed how he applied the teaching and delivered it to the class. Carl ensures when he teaches he focuses on the fundamentals ensuring the stance is the correct width and the hip is used to deliver the technique. Carl joined from another club in 2014 as a 1st Dan and it has been a real privledge to guide him further on his Karate journey. Carl's essay is a well worth a read and i would encourage all to take a look. 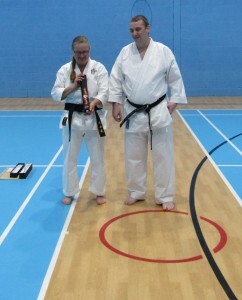 Kim Hedley became the first 2nd Dan graded by Steven Beresford, her grading was a tough test of all her Karate ability. The test was in 3 parts, Kata and Kihon, Teaching and Kumite and Application of Kata. Kim showed she has gained the knowledge and is able to apply everything she knows in to her teachings. She has brought so much to the club since joining and has supported Sensei in developing this club into a great club. For Sensei his only regret is Kim didn’t continue her journey sooner or found Sensei sooner as within the last year she has helped out and taught Sensei so much and helped him develop as a instructor. Kim is a fantastic role model for all students and a pleasure to teach. Kim's help teaching the club only helps keep the standard we are producing high and has allowed the growth we have achieved. This has allowed Sensei to finally hit many of the targets he set out to achieve in 2006. Probably loads more to say but importantly it has been a privilege for Sensei to have Kim at the club, teach and guide Kim since she started her Karate journey again. 3rd Dan 2019! must definitely be the target! Also I am pleased to announce you as Assistant Chief Instructor. We are looking to increase the number of students in the age range of 11 - 19 years, until September 30th 2016 we will be offering half price membership to all within the age group. Open to all new members, returning member and open to new or experienced students. Due to the club's fantastic growth over the last 4 month we unfortunately have out grown our current venue on a Sunday and now on a Tuesday. We will be training in the Sports Hall at the new time of 5pm - 6:30pm on a Sunday as we did move to the gymnasium but it was too small for our Sunday class. The Tuesday lesson is also in the Sports Hall at the usual times of 6pm - 7pm under 11s and 11 and over 7pm - 8pm. So far this has been a great success and we have had new members continue to join! We have potential to grow even more at our new venue so please keep spreading the word! We Achieved our 150th member on the 12th April 2016, our 100th member was achieved last year on the 18th April 2015 so we have come so far in just less than a year. 200th Member is the next milestone, would be great to achieve by the end of 2016! On the 7th February 2016 Katie Strangward, 15 years old was awarded her 1st Dan Black Belt at Junsui Shotokan Karate Do becoming the 1st student to achieve white belt to black belt under Sensei Steven Beresford. Katie joined the club in February 2013 and showed fantastic natural ability, achieving her Black belt in just short of 3 years. Katie also helps teach the little tigers class and has the potential to be a superb instructor, she has dealt with many different students and has a real talent to teach to a students ability. She is always getting fantastic feedback from parents and students. 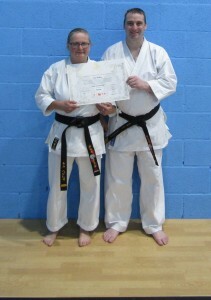 Katie’s Black Belt grading consisted of an examination over 4 days and also an essay. On day one and two Katie had a 1 hour and half examination demonstrating her basic moves and combinations, Kata and sparring. On day two Katie also had to demonstrate her knowledge and applications of the Kata. On Day three Katie had to demonstrate her teaching ability taking the little tigers class alone, some students were tasked to do a couple of mistakes which were quickly corrected. For the second hour on day three Katie was again put through intense basics, kata and finishing with some more knowledge testing, application of Kata and self defence tests. On day four Katie was put through everything again with more sparring added including against multiple opponents, at times sparring up to 3 opponents for over 10 minutes. Katie had to wait to the following lesson to learn the results of the examination to which she passed with a fantastic display of her Karate and showed a desire throughout the grading to never give in no matter how exhausted.